IC1396 is a huge, faint emission nebula in Cepheus. Because it is very big and not very far away (just 2000 light years or so), it doesn’t even come close to fitting on my camera’s sensor, but it has some really interesting features that make even partial shots of IC1396 pretty. 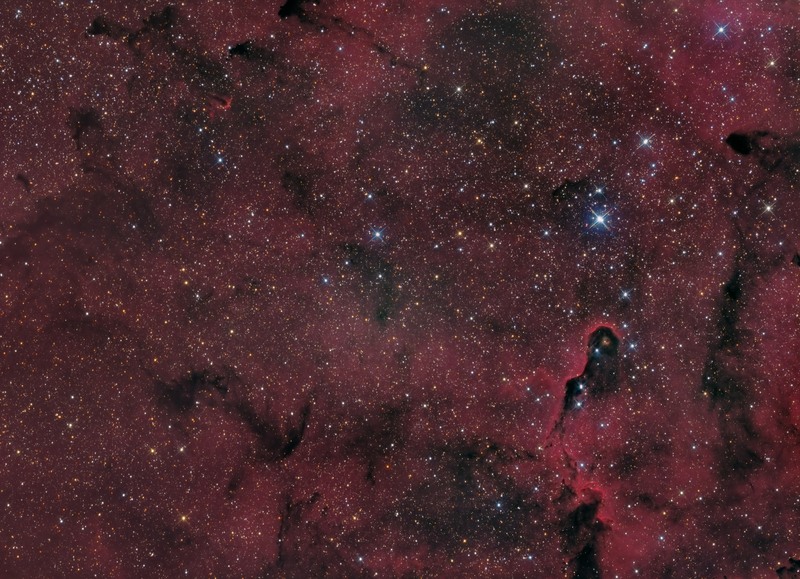 This image shows one of IC1396’s showpieces, the Elephant’s Trunk Nebula, at lower right. I’ve often shot that object on it’s own, or as the centrepiece in an image. This time, though, I let the dark nebulae nearby take centre stage. These patches of soot and dust snake through the glowing gas of IC1396, leaving obvious spots where there are few or no stars visible. There are dark nebulae throughout the Milky Way, but they really stand out nicely when contrasted against the bright and starry background of an emission nebula like IC1396. SBIG STL-11000M camera, Baader LRGB filters, 10″ f/3.6 ASA astrograph, MI-250 mount. Guided with STL-11000’s internal guider. Focusing with FocusMax. Acquisition, guiding, calibration in Maxim-DL. All other processing in PixInsight. Shot from my SkyShed in Guelph, Ontario. No moon. Below average transparency and average seeing. 8x10m of R, G and B and 7x20m Ha for a total of 6hr20m. Ha, R, G and B masters were cropped to remove edge artifacts from stacking. The R, G and B channels were combined to make an RGB image. Ha and RGB were processed with DBE, combined with the NB-RGB script, and Colour Calibration was applied. HistogramTransformation was applied, followed by TGVDenoise and another HistogramTransformation to reset the black point. Creation and cleanup: The R,G,B and Ha masters were combined using the ImageIntegration tool (average, additive with scaling, noise evaluation, iterative K-sigma / biweight midvariance, no pixel rejection). DBE was applied to neutralize the background. Deconvolution: A star mask was made to use as a local deringing support. A copy of the image was stretched to use as a range mask. Deconvolution was applied (100 iterations, regularized Richardson-Lucy, external PSF made using DynamicPSF tool with about 40 stars). Stretching: HistogramTransformation was applied, followed by TGV Denoise and another HistogramTransformation to reset the black point. No pixels were clipped during either stretch. 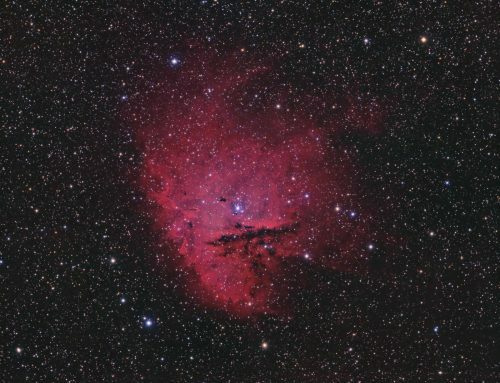 The Curves tool was used to boost brightness, contrast and saturation of the nebula. 1. Extract luminance from the HaRGB image. 2. Apply LinearFit using the SynthL channel as a reference. 3. Use ChannelCombination in the Lab mode to replace the luminance of the HaRGB with the fitted luminance from step 2. 4. LRGBCombine was then used to make a SynthLHaRGB image. 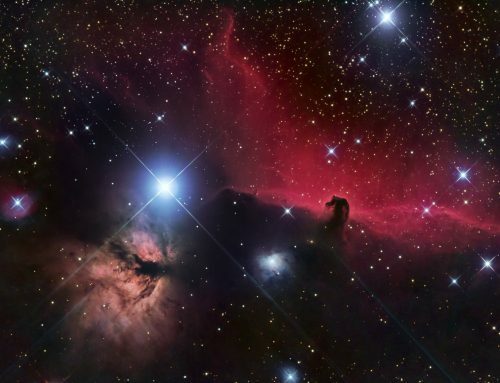 HDRMultiscaleTransform was applied at a 6 pixel scale with a star mask to protect cores of bright stars. Small-scale structures were isolated using MultiscaleLinearTransform (4 wavelet layers, residual layer deselected) on a copy of the SynthLHaRGB image. Large-scale structures were isolated by subtracting the small-scale image from the SynthLHaRGB (no rescaling). A duplicate of the small-scale image was used as a mask on the small-scale image and contrast was boosted. Colour saturation and contrast were boosted on the large-scale image. Then small-scale and large-scale images were added back together in PixelMath. The Dark Structure Enhance script was applied (strength 0.1). Colour saturation and curves were adjusted slightly. Image scale is about 2.2 arcsec per pixel for this camera / telescope combination. 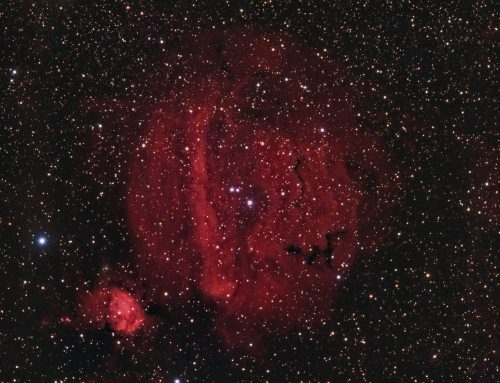 Ron is an avid astrophotographer who hunts deep sky treasures with his camera and telescope. 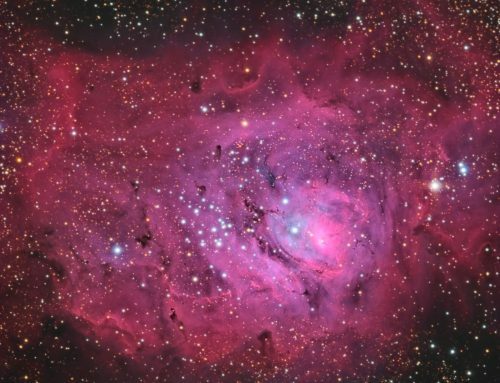 He shares the amazing cosmos with others through astrodoc.ca.